Have you heard of the “see food” diet? You know the one — you see food, and you eat it. Well, it turns out, there’s a lot of truth to that phrase. A new study from Cornell University has found that the food we leave out on our kitchen counters plays a significant role in determining what we weigh. Talk about a new twist on a “see food” diet! It has often been said that the kitchen is the heart of the home. It’s the place we congregate after school and work, and come together for meals. At a party, it’s the one place people are guaranteed to hang out. You can tell a lot about a person when you step into their kitchen, and the food items that are currently on your counter may serve to shed light on why you may be struggling to lose weight. In the study, “Slim by Design: Kitchen Counter Correlates of Obesity,” scientists examined photographs of over 200 kitchens in Syracuse, New York, to see what items were on subjects’ countertops. They then analyzed subjects’ body mass index (BMI) to see if there was a relationship between certain foods and participants’ weight. Fresh fruit apparently serves as a good influence on women; ladies who kept fruit on their countertops tended to be a normal weight. However, if certain snacks — like soda and cereal — were accessible, women were an average of 20 pounds heavier than comparable subjects. “It’s your basic See-Food Diet – you eat what you see,” Brian Wansink, lead author of the study and director of the Cornell Food and Brand Lab, said in the university’s press release. Women who kept sodas on their counter weighed 24 to 26 pounds more than women who didn’t do so. Similarly, women who kept a box of cereal within easy reach weighed on average 20 pounds more than women who did not. According to the study, the mere presence of a bowl of fruit on the counter predicted a lower BMI for both genders. However, although cookies, cakes and muffins held little sway over women, men showed a higher than average BMI if they lived in a household with baked goods regularly stored on the counter. Perhaps Dr. Wansink’s remarks about cereal can shed some light on the dichotomy here: “As a cereal lover, [the results] shocked me,” he said. “Cereal has a health-halo, but if you eat a handful every time you walk by, it’s not going to make you skinny.” Perhaps women who keep cereal on the counter end up netting more calories than they realize by doing just what Dr. Wansink suggested — they grab a handful every time they walk through the kitchen. So what is a normal body mass index (BMI)? According to the National Institutes of Health’s National Heart, Lung, and Blood Institute, a normal BMI falls within the range of 18.5 to 24.9. BMI is calculated using your height and your weight and offers physicians a good idea of the amount of body fat you carry around, as well as your overall health. If you’re curious about your BMI, a number of calculators are available online. Well, if that isn’t motivation to keep a bowl of apples on your counter, we don’t know what is. Bear in mind that it’s best to be choosy about the fruits you keep out. Bananas, for instance, are delicious but don’t offer as much fiber as other fruits, like apples. 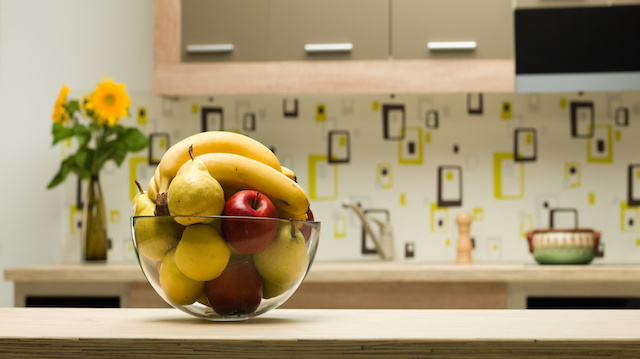 When it comes to food on your counter, it seems any fruit is better than soda, cereal or baked goods. What kinds of food do you keep within easy reach on your countertops? Hey Buddy!, I found this information for you: "The “See Food” Diet: How the Items on Your Counter Predict Your Weight". Here is the website link: https://www.thealternativedaily.com/the-see-food-diet/. Thank you.